Just last week when we were doing our routine Flash Cards sesh, Myla tried to tell me that she wanted to sit on an elephant. The video is on my Instagram. She really loved it and was mesmerised. I don't think she recalls having been to the zoo twice before already (she was 1yo plus then, slightly more than a year ago). 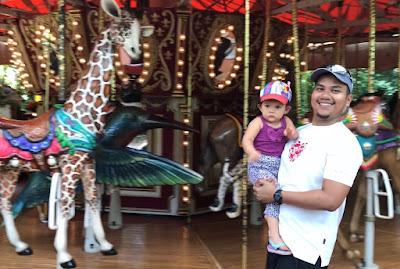 She didn't get to sit on the elephant (obviously lol)... but we did get her a ride on the fake elephant on the carousel. It was a toss up between the giraffe and the elephant (both her favourites at the moment). And this time round she was able to go for a pony ride too. She was quite serious and focused for the entire short ride lol. Not like Wheeee ponyyyyy!!!!! Oh wells, I hope she can remember this experience. Just a bit of info in case you want to go for it, kids have to be under 120cm to ride the pony. But if they're very young, probably cannot (cos they didnt allow her to ride when she was 1 year old last time). It's $6 a ride and yes, very very safe, no worries. It was a fun afternoon out for the family, but oh man with a toddler and baby, we were both shagged balls. Now need to recuperate for many weeks hahahahaaaaa.